How cool is this: To mark the 40th anniversary of the Internet, DARPA has announced the DARPA Network Challenge, a competition that will explore the roles the Internet and social networking play in the timely communication, wide-area team-building, and urgent mobilization required to solve broad-scope, time-critical problems. 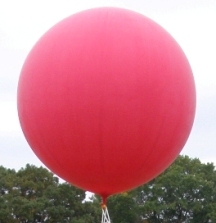 The challenge is to be the first to submit the locations of 10 moored, 8-foot, red, weather balloons at 10 fixed locations in the continental United States. The balloons will be in readily accessible locations and visible from nearby roads. A $40,000 cash prize will be awarded to the first entrant to submit the latitude and longitude of all ten balloons. I LOVE IT! 😀 PLEASE let me know if you’re participating.